Take 270 North or West (depending on direction you are coming). Pass Sawmill Road Exit. 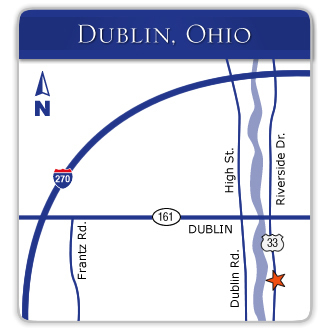 The next exit will be US-33 (SR 161) to Dublin or Marysville. Take Exit 17A towards Dublin (2nd Exit). Go about 1 mile and take a right on Riverside Drive (33 East). Drive approximately 200 yards and turn right into the parking lot. You will see a small house on the right and the entrance is immediately after this house. Our building is on the southwest corner of Riverside Drive (Route 33) and Route 161. Take 270 North or East (depending on direction you are coming). The next exit past the Tuttle Mall exit is US-33 (SR 161) to Dublin or Marysville. Take Exit 17A towards Dublin. Go about 1 mile and take a right on Riverside Drive (33 East). Drive approximately 200 yards and turn right into the parking lot. You will see a small house on the right and the entrance is immediately after this house. Our building is on the southwest corner of Riverside Drive (Route 33) and Route 161. Exit 270/Sawmill Road SOUTH. Drive approximately one mile south on Sawmill Road and turn right (west) on Route 161 (Dublin-Granville Road). You will approach a large roundabout. Take the third exit off the roundabout. Be careful as this roundabout is new and drivers are still getting used to this new structure. Go about 200 yard and take the first turn on your right. Make sure to pay attention to drivers coming from the north on Riverside Drive from the underpass. You will see what looks like a small house (6173-6175) and the entrance is immediately past this house. It almost appears as if you are turning into the house driveway. There is a large parking lot and two-story building where we are located.